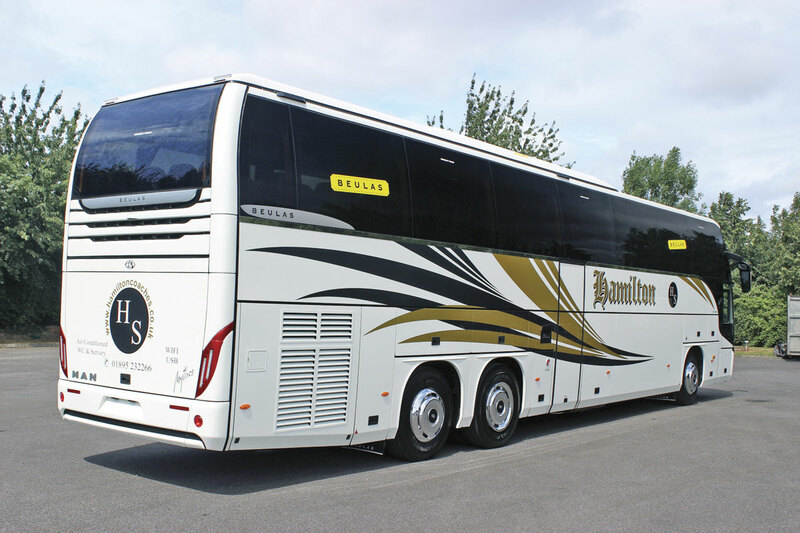 For a relatively small coachbuilder by modern day standards, producing around 300 bodies annually, the Spanish Beulas concern offers an amazing variety of products ranging from the diminutive Gianino midicoach up to the double deck Jewel. The company first came to the UK in the 1990s in conjunction with Iveco and Coach Europe, offering the Stergo e and the higher floor El Mundo on the rear engined EuroRider chassis. When Coach Europe failed, the franchise went to Mentor and when they failed it passed to Holmeswood’s BASE Coach Sales subsidiary. In over a decade of offering the marque, BASE sold over a 100 units, many to its own fleets, but Beulas had greater ambitions and last year, appearing at the Euro Bus Expo in its own right announced the appointment of the associated Moseley group of companies to distribute its products in the UK. Having previously offered MAN engined Van Hool integrals and been forced to stop doing so by the German manufacturer’s decision to stop supplying engines to its competitors, the three dealerships, Moseley (PCV) Ltd, Moseley Distributors Ltd and Moseley in the South Ltd, renewed their MAN links by offering Beulas on MAN chassis. It has taken a while for the first fruits of this new relationship to arrive in the UK but last week the first two examples reached our shores. One was a 10.8m long Cygnus on the MAN RR2-19.360 chassis that will be supplied by Moseley Distributors Ltd and the other was the very first Beulas Mythos to be sold in right hand drive form, a 14.4m example on an MAN RR4 26.480 chassis. 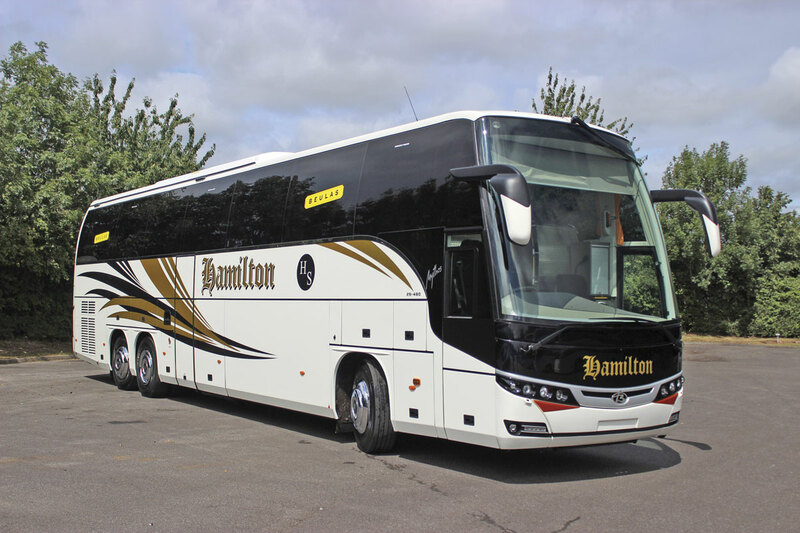 The Mythos, a 3.985m high super high floor coach with a massive luggage capacity, is being supplied to Hamilton Services of Uxbridge. Having recently been there to see the new Sitcar Voyager minicoach, Stuart Jones went back down to Moseley in the South’s Taunton premises for a closer look at the Beulas duo, within hours of their arrival in the UK. Since they ceased selling MAN powered Van Hool integrals, the associated Moseley dealerships have been left with a number of holes in their product offering that VDL cannot fill with the Futura/Synergy ranges and neither can the Scania Van Hool combination, which has thus far been limited to two-axle Alicron models, though tri-axles will be available for next season. 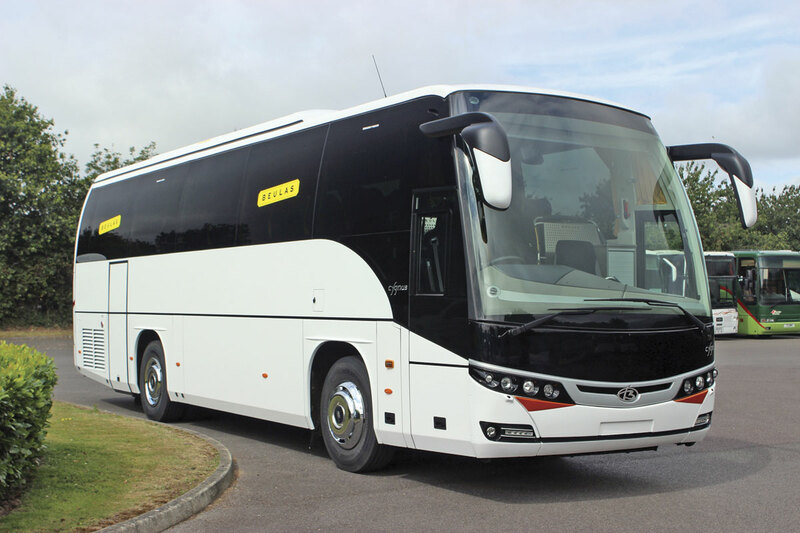 Well regarded for their quality and flexibility, Beulas appear to have a coach body option for every application, with a truly remarkable range of models and length options. As well as the best selling Aura high floor, there are the Gianino small coach (originally sold as the Stela in the UK), Spica, Cygnus, Aura, Glory, double deck Jewel and super high single deck Mythos. Each model can be built on a variety of chassis though Moseley. At last year’s FIAA exhibition in Madrid, Ramon Beulas told me that Moseley would be offering both VDL and MAN chassis, but my understanding is that the current plans will only see MAN chassis offered. Completely new for the UK is the Mythos. Sallyanne Davis tells me that Mythos is a renowned Greek beer, an explanation rather more on my intellectual level than the Webster’s dictionary’s definition, which is: ‘a pattern of beliefs expressing often symbolically the characteristic or prevalent attitudes in a group or culture.’ Regardless of what it means, it is the name Beulas have chosen for their super high single deck coach. At 3,985mm over the roof mounted air conditioning system, it is 20cm higher than the Aura, examples of which are already operating in the UK, and only 15cm lower than the double deck Jewel and Glory overdecker. 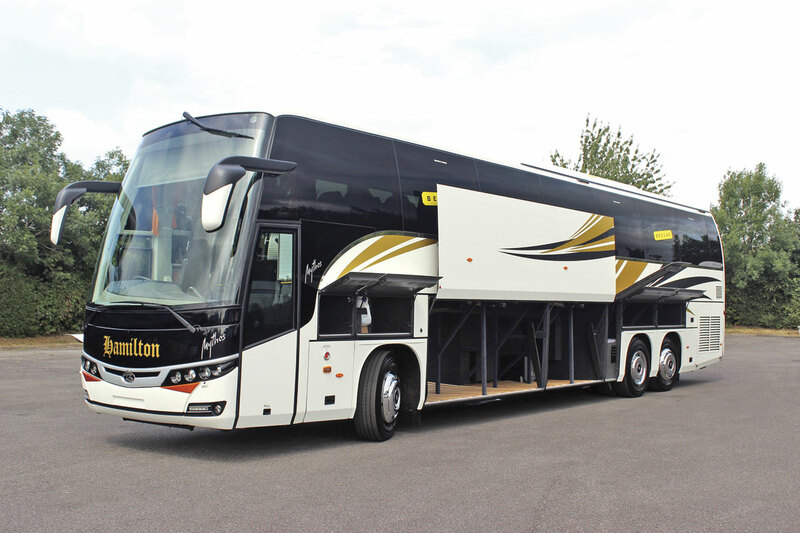 It comes in a variety of lengths, the standard being a 13.2m long 59-seat version though this first example is a formidable 14.4m long which enables it to be specified with 67 recliners and a centre sunken toilet with seating over the top of it. Also possible are 13.7m and full 15.0m variants, the latter providing up to 71 seats. There is a considerable degree of modularity incorporated within Beulas’s designs and all share the same look. The latest versions all have a ‘smiley’ front panel with a curved brightwork moulding incorporating the Beulas roundel flanked by rows of four individual round lights that slope gently upwards towards the outer edge of each side. Distinctive visual elements include deep one piece screens on single deckers, with a glazed curved window section beneath the first main side window on each side and small horizontal mouldings that stand slightly proud of the body side over each wheelarch. An upper screen windscreen wiper is provided as well as the standard ones. Roof fairings shroud the rear section of the roof disguising the centrally mounted Hispacold air conditioning equipment on larger single deck models, making them look slightly taller than they are. The 14.4m Mythos is a formidable but nevertheless elegant coach that looks in proportion despite its height and considerable length. With standardised passenger compartment dimensions the additional height between the saloon deck and the ground is fully utilised to provide additional luggage capacity. Over and ahead of the front axle there are separate lockers on both sides. The forward ones provide storage space that can be accessed internally via roller shutter doors to the rear of the driver and courier. 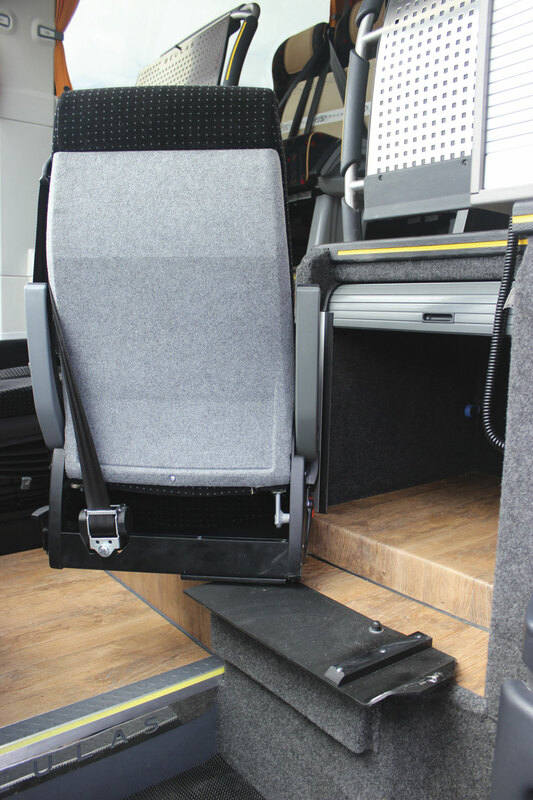 Both the courier seat and Isri driver’s seat swivel to improve this access further, though obviously not when in motion. 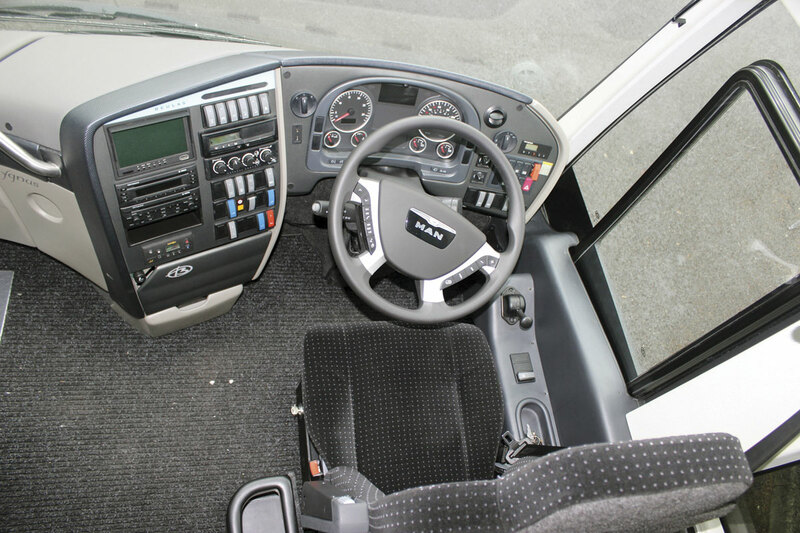 The nearside front over wheelarch unit contains the screen wash reservoir, with free space on the offside. 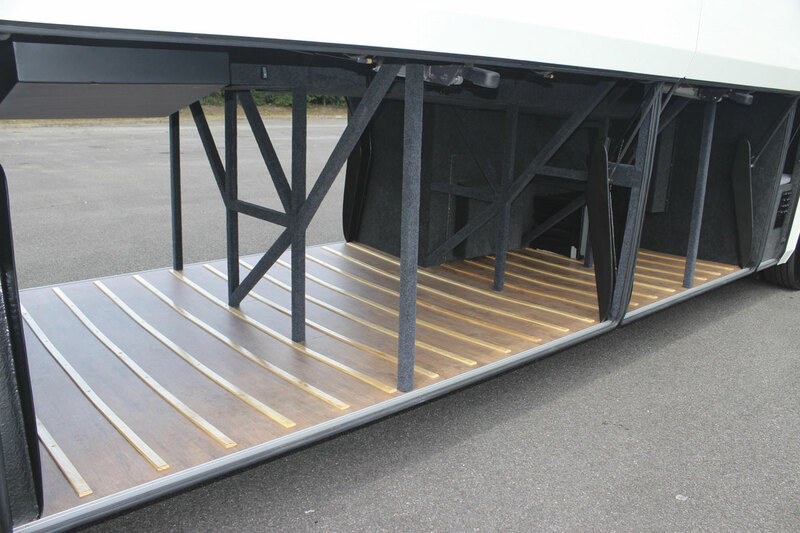 Over the rear axle there is a full through locker which, as all lockers do, have the floor covered in wooden plank effect laminate floor covering. Bryan Reed, Service Manager at Moseley in the South, pointed out that the floor traps within this locker were mirrored in the saloon floor above, giving better access to the rear axles, something he thought was potentially a big benefit for maintenance. 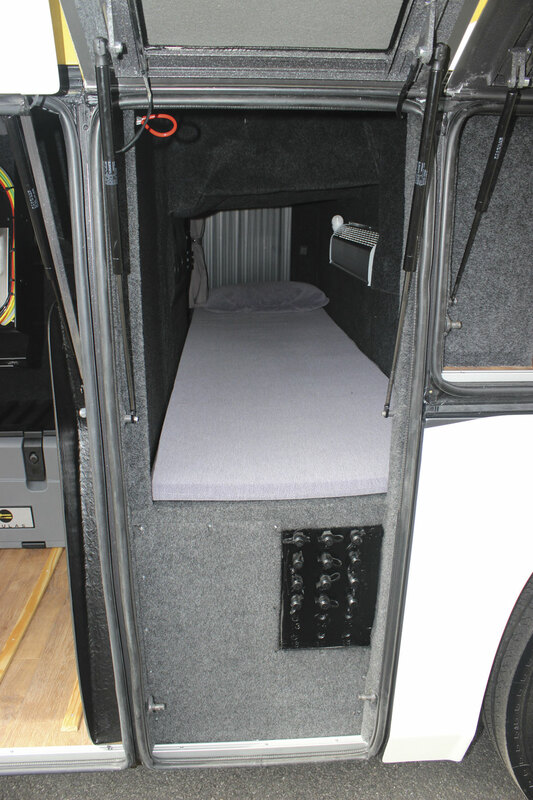 All of these lockers together with that for the separate full width driver’s sleeping berth located to the rear of the main luggage hold within the wheelbase, were equipped with top hinged manually operated locker doors. The spacious main hold benefits from wooden rails running across its width to ease loading and reduce the likelihood of water damage to cases. The floor is not completely flat, sloping up toward the edge on each side. 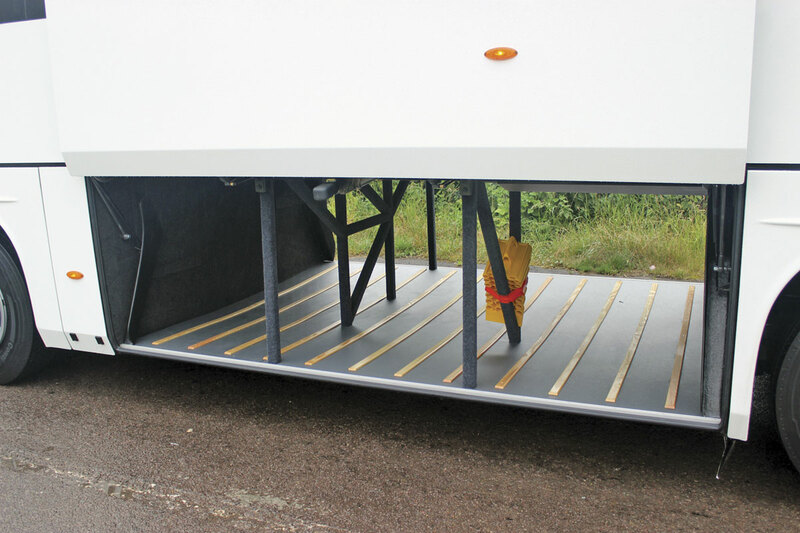 Powered cantilevered locker doors, just one on the offside and two on the nearside, seal the space, lifting sufficiently high when open not to impede the driver during the loading process. On the offside the toilet compartment takes up part of the hold and once again there is a top hinged locker alongside that reveals the various elements necessary to keep it functioning. 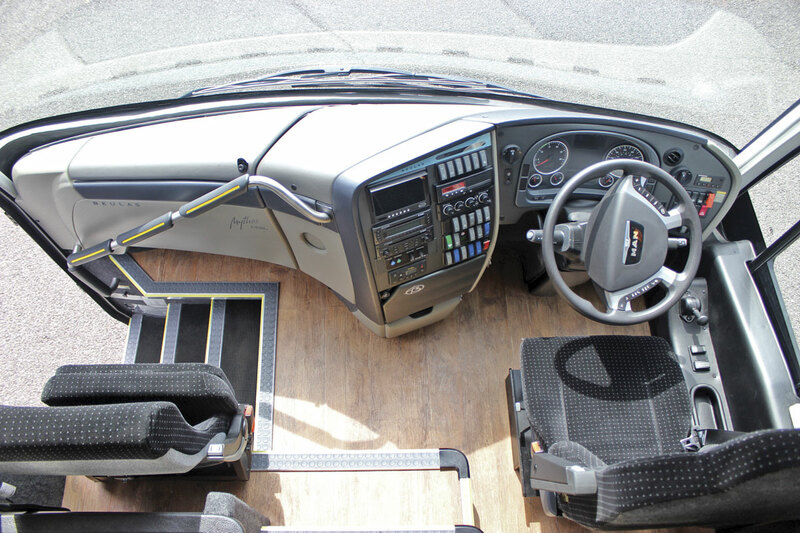 Additional offside lockers are provided beneath the driver, behind the rear axle, and to the rear of the continental door beneath the driver’s berth. Within the main locker there are drop down centres for various key functions. On the nearside at the front of the hold is the electrical centre for the MAN components, with the Beulas centre opposite on the offside. At the rear of the nearside hold is the pneumatics control centre, just above where the tool kit, that comes as standard in a neat Beulas tool box, is stored. There is also a handy bank of test ports for checking the chassis air systems which is very accessible as it is built into the lower part of the structure within the locker containing the driver’s bunk. 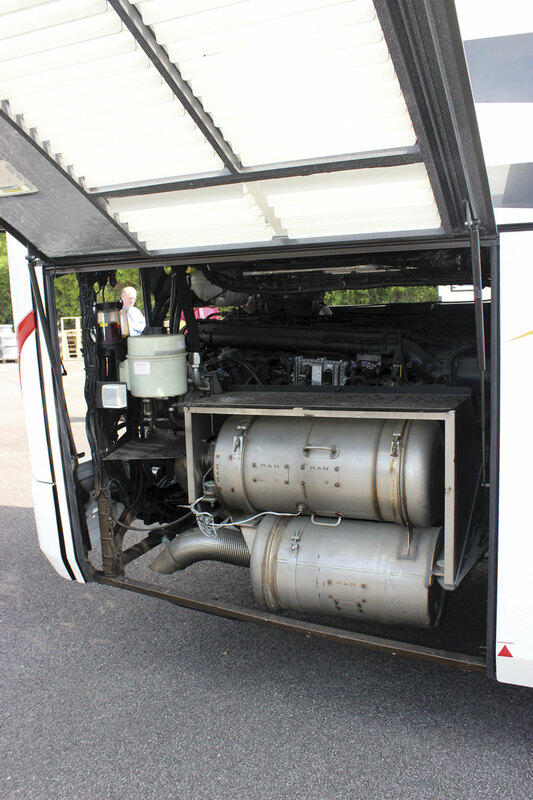 The engine is mounted at the rear and is considerably less hemmed in than in most Euro6 installations, with good access from both sides, to the rear and over the top, as well as from the rear via a top hinged flap. The cooling pack is at the very rear of the nearside with the 60-litre AdBlue tank in the lower locker between it and the rearmost axle. On the offside are the two with associated pipework of the SCR element of the emissions control system. 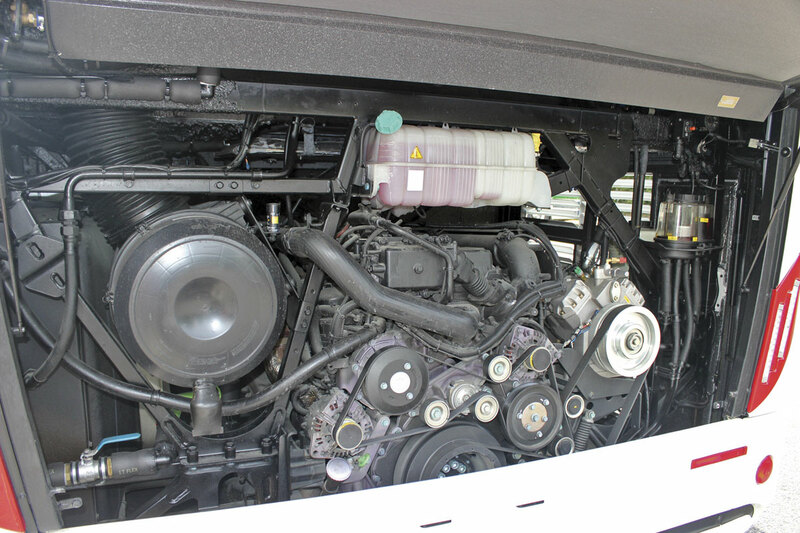 The standard diesel tank holds 480-litres with the option of an additional 200-litre unit. Filling points are behind lockable flaps on both sides located to the rear of the front over-wheelarch lockers. Buyers of the Mythos are almost certainly either going to be using them for express services, large party private hire, cruise work or touring and in most cases the luggage capacity will be an important factor. It is certified for 1600kg based on 100kg per cubic metre. With such a high vehicle, getting the entrance right is critical and I think Beulas have done a good job with the Mythos. There are four steps from the ground to the platform alongside the driver, each tidily edged in aluminium with a yellow edge strip and penny rubber section ahead of rubber matting inset into the step itself. To the left there’s a useful handrail with yellow inserts to assist less well sighted passengers, and there’s a hand hold low down on the right too, though nothing in the vicinity of the courier seat itself. The risers are in grey, with grey soft trim to the right below the courier seat, a choice I would avoid because soft trim and mops don’t mix well. The platform itself is a wood effect laminate as is all other saloon flooring apart from the centre door steps. As you mount the stairs you see the stainless steel and black honeycomb effect curved decency panels and turning to your right and surmounting a further three steps you get a view of the saloon that passed my first impression test with flying colours. The lines are clean and uncluttered and everything coordinated well with the possible exception of the bright orange curtains. Trim panels are in shades of grey and the laminate side casings have a hard finish that looks good and will clean easily. The seats are level on podiums but the aisle itself first inclines slightly, then dips in the centre before climbing again. 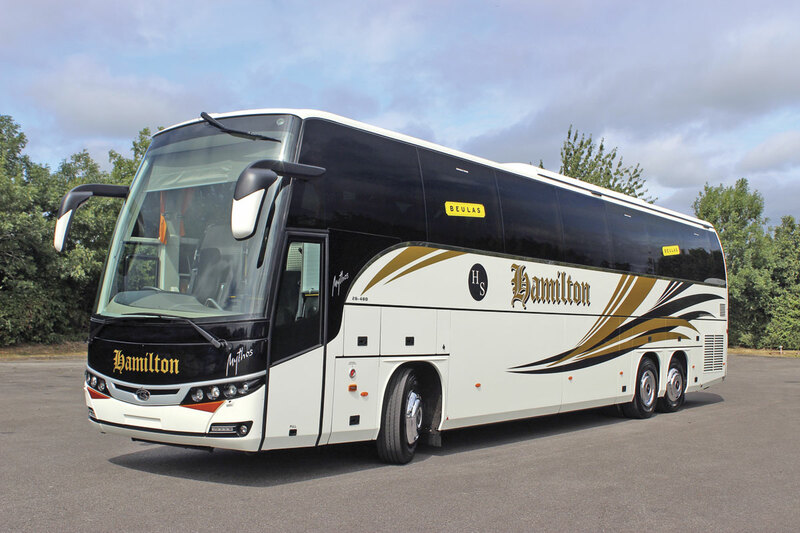 In capacity terms, it was originally envisaged that the maximum in the UK would be 63 recliners but as the Hamilton’s coach shows, it proved possible to accommodate 67 recliners without compromising noticeably on legroom. There is one compromise, and that is that the toilet compartment sits beneath the final row of offside seats ahead of the centre continental exit. As toilet compartments go, and few sunken ones are exactly ideal, it is slightly restricted with regard to headroom but not unacceptably so. The light is on a timer and the tap can’t be left running because it is controlled by a sensor that recognises when there is a hand there. It is a long climb down the five steps to the bottom of the centre staircase (six to the ground) for an older person but there is a good handrail to hold on to, though the fact that the pivot door tries to close unless you hold on to it and there is a lip to the lower section of the compartment do not make entry easier. 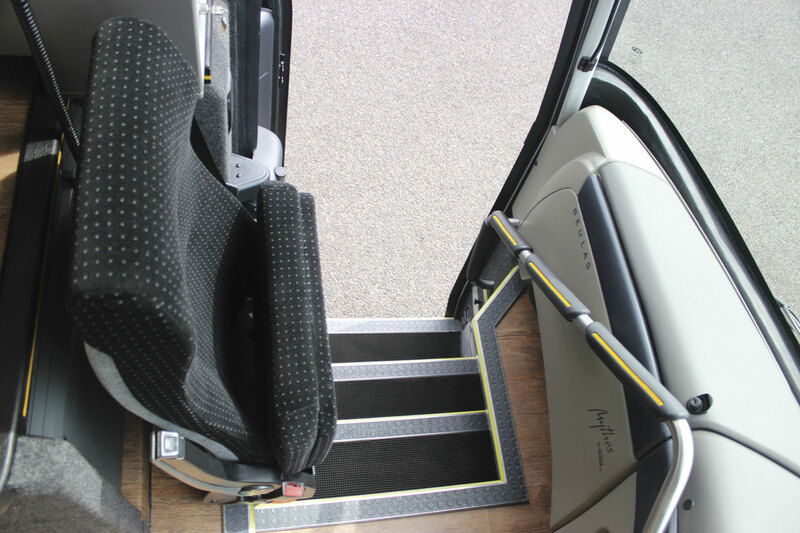 The top step is slightly inset within the main gangway and the floor dips in the central section to lessen the altitude that the steps have to reach. There is also a rubbish bin mounted high on the rear of the continental door. 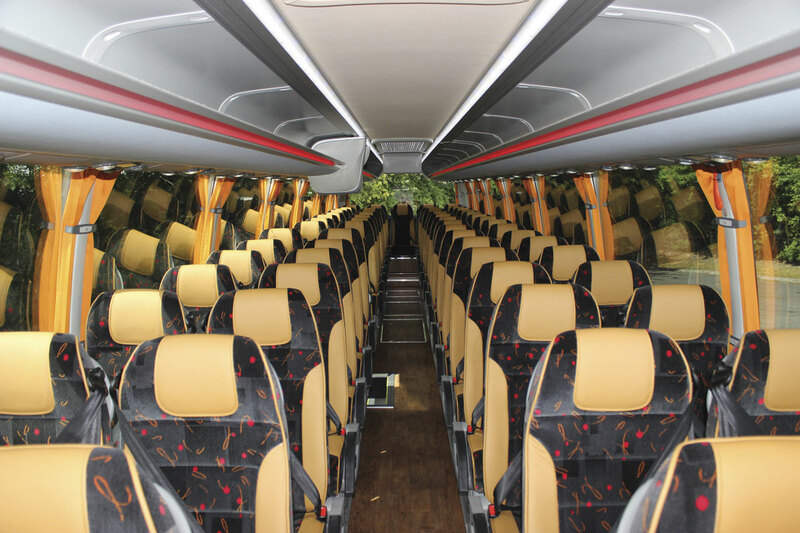 The seats used are from the Turkish manufacturer Sege and (I think) are the Buscomfort 4030X model. On this coach they were equipped with the three point belt option, though two-point belts are standard along with aisle armrests, adjustable footrests, folding seat-back tables with cup cut-outs and two handles on the rear of each headrest. Seat trim was moquette, including the rears, with leather headrest inserts, side panels and piping. I found the legroom comfortable as long as the seat in front of me was not reclined. Although 67 recliners were installed and personal service units were located accordingly, realigning them for lower capacities is relatively straightforward as the units clip in and out. I was told that moving them can be accomplished in an afternoon and a complete conversion including moving all the seats is a day’s work. Two monitors are standard, one at the front and a second above the toilet compartment, but in such a long coach, Moseley in the South MD, Allan Vaulter, thinks a third towards the rear of the coach is really a necessity. This coach had one, a drop down unit mounted within the ceiling above the aisle. Another optional feature installed was a multi coloured RGB lighting system within the racks that enables the driver to alter the ambience by replacing the standard lighting running the length of the racks with a different colour or a succession of different colours at the press of a button. The speed at which colours change can also be varied with the option of a rapid continuous colour change, something that would drive me nuts. There was little not to like about it, one minor thing I noted being that the lower curtain retainer rubbed on my arm when sat in the rear corner seats. It could usefully be mounted a few inches higher. I was also puzzled about some small panels in the front headlining in both coaches which were in a different shade to the rest of the unit and a less than exact fit. At the business end, the swivelling driver and courier seats are novelties, though I wonder in practice how often this facility will be used. The cab itself looks to be well laid out though some of the pictograms on the switches aren’t particularly intuitive. To familiarise drivers, laminated cards explaining what everything is are provided. We’ve criticised driver’s signalling windows on some other models but this one, an electrically powered unit, appeared to present no line of sight difficulties for the driver. The courier window was also powered as was the sunblind. The mirrors gave a good view, backed up by a reversing camera, but the wiper sweep did not completely clear the area in front of the offside one. The MAN RR4 tri-axle chassis family superseded the earlier R37 model and is closely related to the RR2 two-axle unit which itself replaced the earlier R33. It is powered by the 12.419-litre six-cylinder in-line MAN D2676.LOH31 Euro6 engine which develops maximum power of 480hp/353kW at 1,800rpm and peak torque of 2,300Nm at between 930 and 1,400rpm. It is matched to the MAN TipMatic 12-speed automated manual transmission which as you probably know by now is the same as a ZF AS-Tronic, complete with intarder, save that it has electronics specified by MAN to match it to the application. It also has the MAN EasyStart system to assist when pulling away. Air suspension is standard with the ECAS system and ZF’s (almost universal) Servocom steering is used. Drive is through the second axle which is equipped with twin wheels. The independently suspended first axle is equipped with a stabiliser and the third axle has single wheels, is steered by means of an EHLA electro-hydraulic system and has a starting traction control system fitted. With the enhanced weight compared with two axle designs the tyres specified are Continental 315/80R22.5s all round on 22.5 x 9.00 ten-hole steel rims. This was a first impression rather than a roadtest but Bryan Reed told me he was extremely impressed with the driving aspects of it. Bryan also pointed out that every Beulas coach comes with a USB stick containing electrical diagrams, a driver’s manual and maintenance, door and dashboard manuals. At a retail price of £318,000 for the specification shown in which only the multicoloured lighting system, three point belts, third television and HM Media Box Wi-Fi system were extras, it is a lot of money for a lot of coach. It’s a lot less than a double deck would be, admittedly with fewer seats, but with a lot more luggage capacity. Conscious that 14.4m is not what everyone wants, Allan told me that he would be ordering the 13.2m model as standard for stock with 57 recliners and a full height toilet. Beulas’s Cygnus should already be familiar to operators as it has been offered for some time and there are quite a number running in the UK already. For this reason I won’t describe it in quite the same level of detail. It sits below the Aura in the range which in turn sits beneath the Mythos. Finished in similar materials and to the same standard as the Mythos, the Cygnus is a lower height coach measuring 3,625mm high over the air conditioning. 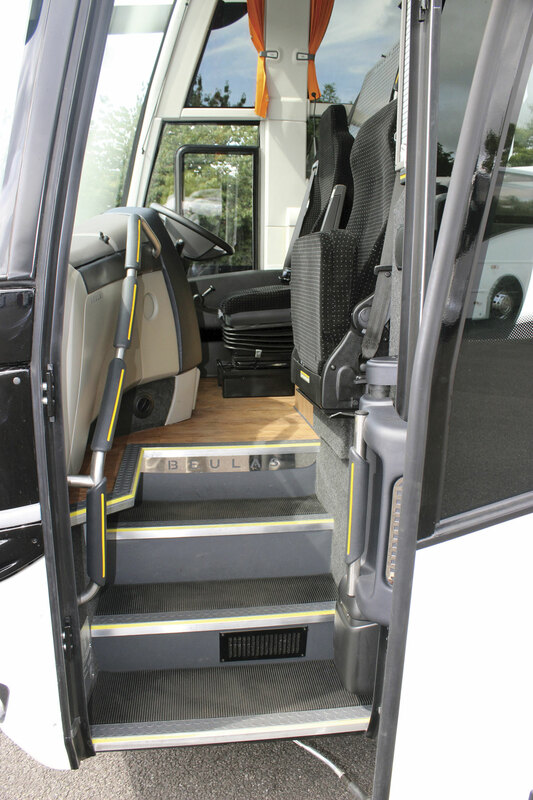 In 10.8m form it offers the choice of up to 43 seats with no toilet or 41 with a rear saloon mounted toilet unit. To look at it, you might think you would get an additional double in without the toilet unit but under European regulations you need 280mm clearance for a decency screen and this prevents it. The coach I was shown, which is a stock vehicle for Moseley Distributors, had 40 seats with no seat in the centre at the rear and a SaniBus floor saloon toilet. I understand that a similar length coach has been ordered for an undisclosed customer that will have 34 recliners, a toilet and a kitchen installed. 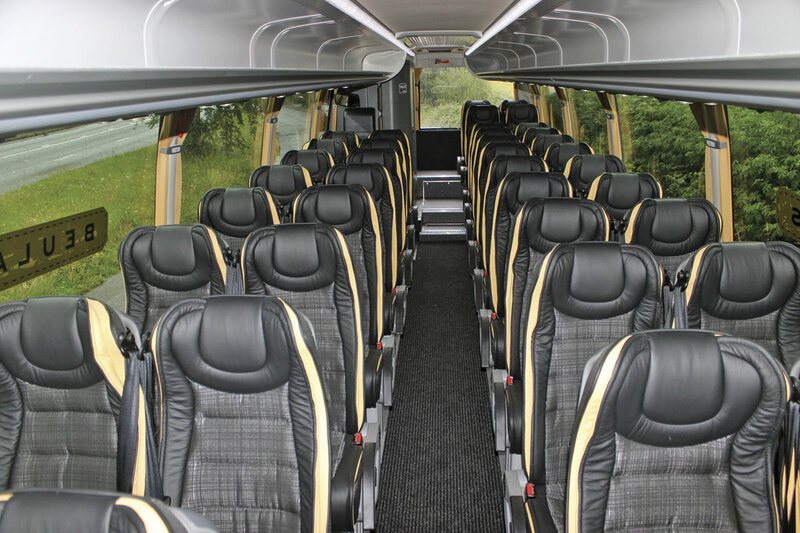 The seats used were also Sege units finished to a higher specification with cream leather edges, rouched leather side flaps and a non moquette woven fabric in charcoal shades (Optima 433) that gave a high quality look and feel. A slightly sunken aisle is flat as far as beyond the rear continental door after which there are two steps up with the last two seat rows set higher than the others. The Cygnus also had the dash mounted fridge, drinks servery and the electric driver’s window, but while the electric entrance door window appeared to be a powered unit, we could not locate a button that activated it. The MAN RR2-19.350 has the 10.518-litre MAN D2066.LOH31 six-cylinder, in-line Euro6 engine which generates power of 350hp/265kW at 1,800rpm and in this coach was fitted with the ZF EcoLife six-speed fully automatic transmission. I did enjoy a short ride on this and despite the short wheelbase it rode very well ‘without dancing about’ as Bryan put it. ‘They’ve got the engine and box mapped together well’, he said. Acceleration was swift but smooth. In the saloon there was no shimmer on the road, and it was very quiet. The retail cost, to the specification shown, is £237,000. Other lengths of Cygnus are also available, including a 12.2m version. Having been to Arbucies to see the vehicles in build, Allan was impressed with what he had seen in the spotless production facility. He particularly praised the underbody treatment, the high quality paint finish and the attention paid to detail. I’ve always thought the Beulas product an attractive one, and both the Mythos and Cygnus lived up to my expectations with good build quality, well matched materials and a smart interior, as well as a few additional good ideas. The demand for super high deckers is not massive and there are others offering them, but if your workload requires one the MAN Mythos is definitely a coach to have a look at. Likewise the sub 12m heavy duty coach market is limited and there are others contesting it but the Cygnus on the RR2 chassis has a lot to recommend it. Within a range that has the potential to offer something for everybody, both are niche products that show Beulas has not lost its touch. 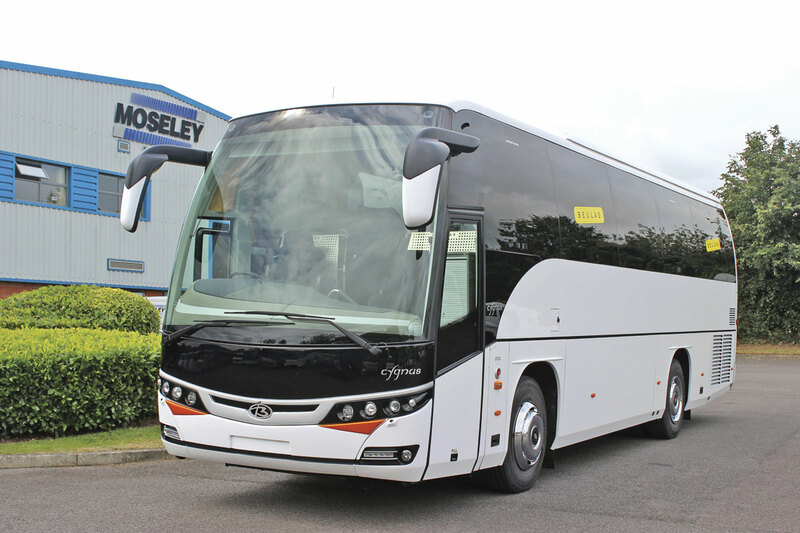 With the three associated Moseley companies now offering its coachwork there is every likelihood that Beulas can attain the increased market share it seeks.